Splash out on upgrading your throne? The Japanese might have been the first to bring technology to the toilet, but even the most advanced throne requires you to touch it. In an age where high-end hotels have touch-less taps, soap dispensers and even doors, why do we still have to touch the toilet itself? Well, those days may soon be over. 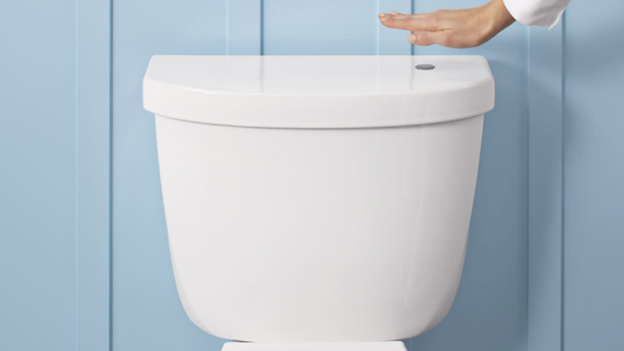 Toilet-maker Kohler has developed the world's first touch-less toilet, which uses electromagnetism to activate the flush when you wave your hand over the sensor. "Unlike a beam-based sensor, in which a beam of light is broken to trigger the actuation, the Kohler Touchless flush utilizes emerging sensing technology, which projects an electromagnetic field that is both extremely accurate and reliable," says Kohler. "This type of sensor detects the user in the projected field and initiates the flush." The company will be bringing the technology to many of its upcoming models and releasing it as a $99 standalone kit that you can attach to your own toilet. It'll work with most single-flush models although if you have a dual-flush toilet, you're out of luck. There's no word yet on UK availability but we'll keep our fingers, and legs, crossed.